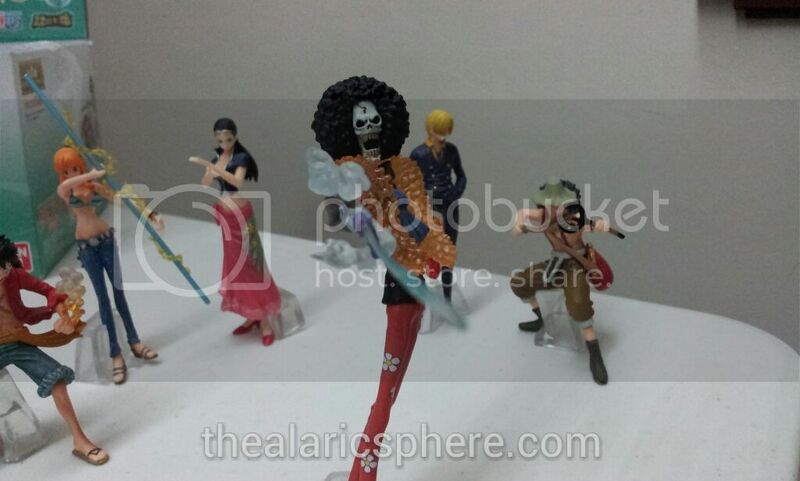 I am in pretty deep with the whole One Piece anime series. 500 something episodes within 4 months, and now the logical next step is to buy the toys right? 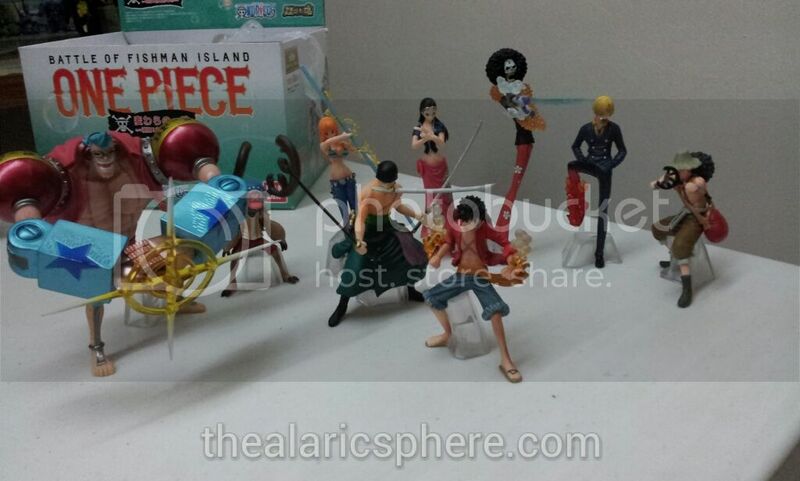 Besides, it really was the toys that got me into the whole One Piece thing in the first place. Finally made my first big purchase recently. 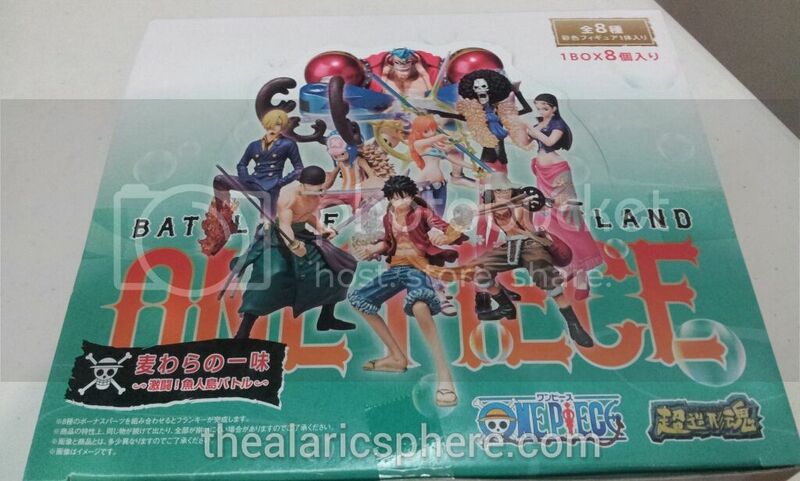 I have been trying to stay off the One Piece merchandise for the longest time since I’m afraid I might run into spoilers if I do. Whether it’s new characters or stuff I’m not supposed to see yet. So after I finally got to the Fishman Island Story Arc, I figured that it would be a great time to get it. 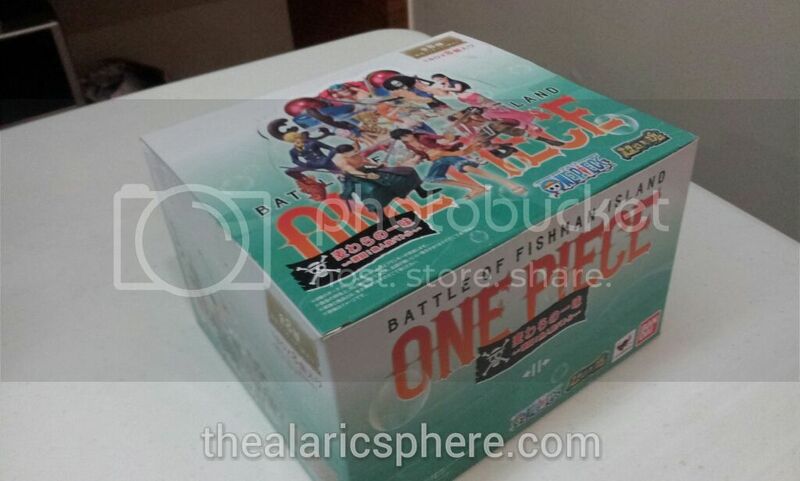 The package contains 8 individual boxes, ideally 1 of each character from Luffy’s crew. Then each character box contains a single part of Frankie which you form together for the 9th character. It was quite a nail biter opening each of the boxes since if, for some reason, there was a duplicate, then it would mean that I don’t get to complete Frankie and I’d be missing another crew member. Luckily, when I opened the 8th box, everyone was present and accounted for. It was nice how all the characters and their equipment or gear were packed nicely. You can also see Frankie’s torso to the right and his shirt to the upper left. Zoro’s 3 swords and scabbards were also all there! Nice! Now onto the review. Let’s start with the captain. 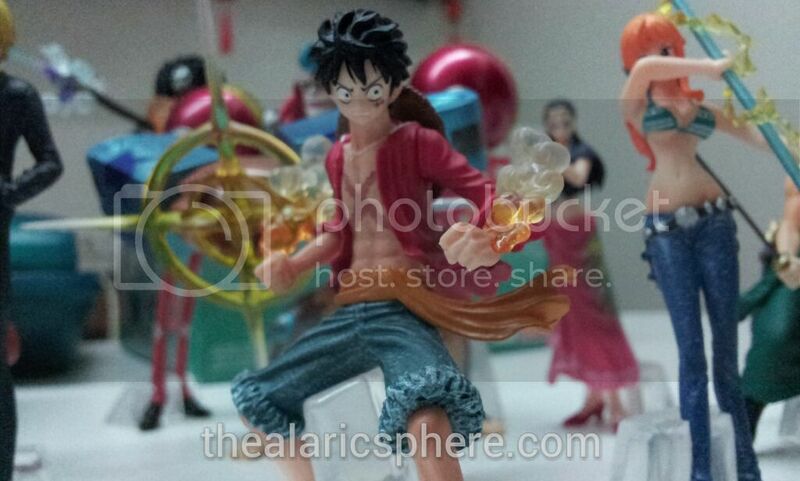 Monkey D. Luffy! 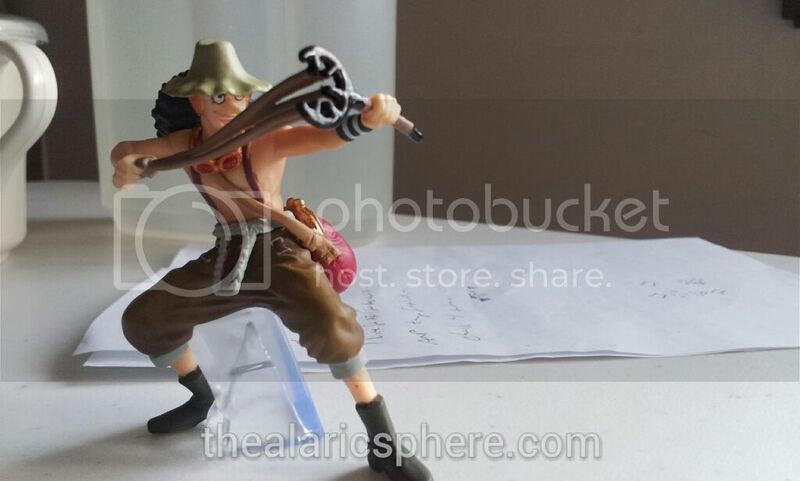 I didn’t know what the scar on his chest was at the time I ordered this. 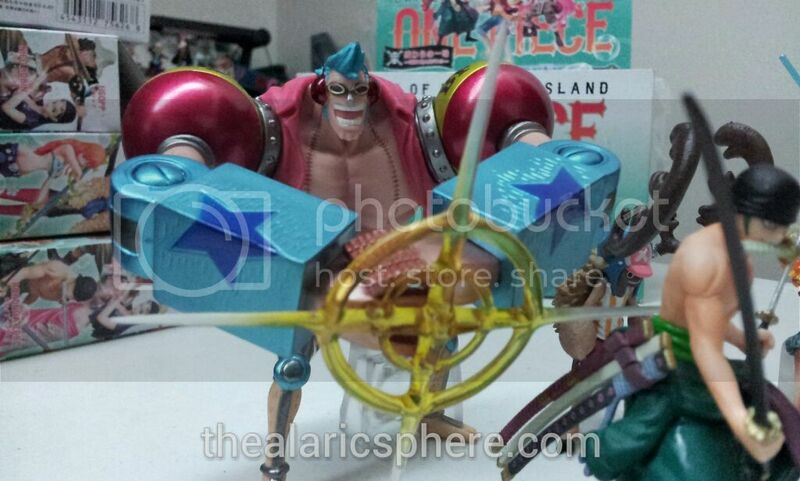 He’s on his Gear Second mode in this and he’s pumped up and good to go. None of that smiling here. I like how he is posed. It makes for a perfect centerpiece when I need to pose him next to his crew. 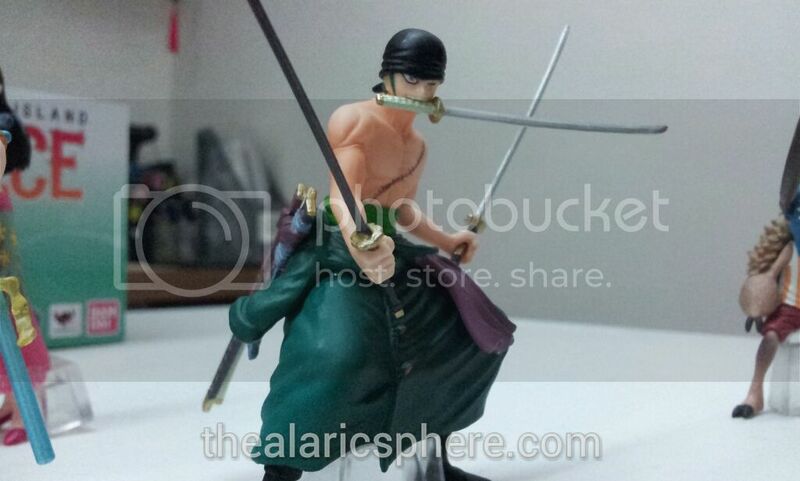 Next up is the swordsman, Roronoa Zoro. This guy has to be my favorite among all the characters in this set. I really love how all 3 of his swords are all detailed as they are in the show and not just 3 generic swords. I also love how his scabbards are also given that much level of detail. He’s also missing his one eye like in the show. I haven’t reached the part where they explain it yet. 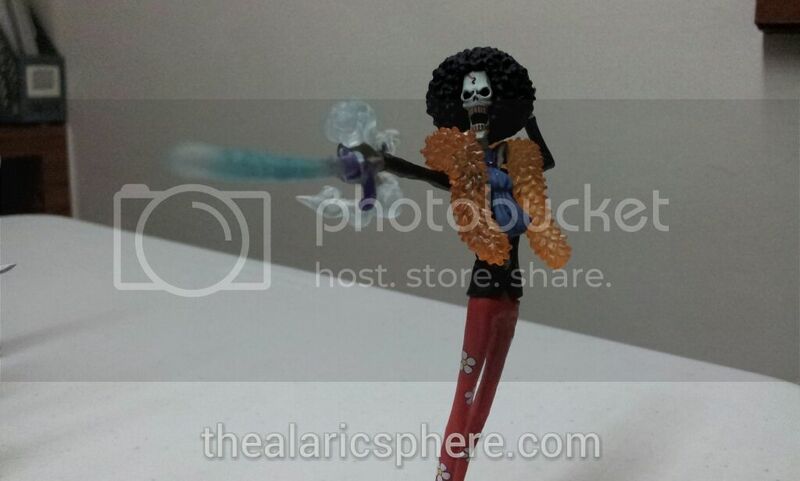 I also really like how he’s posed. 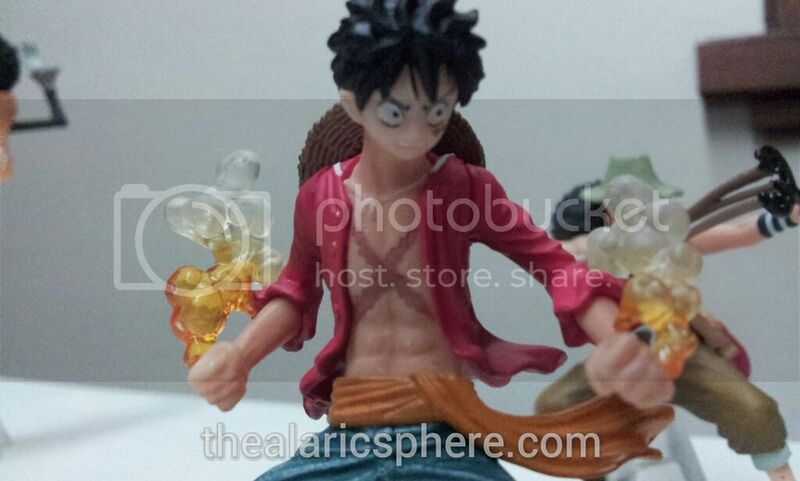 All set and ready to fight for Luffy. All 3 swords and scabbards can be removed. 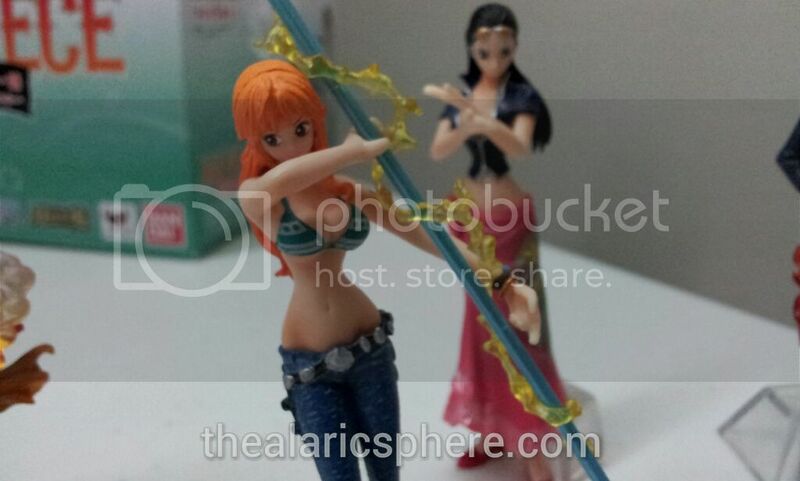 Nami the navigator is up next. She is wearing her post time-skip bikini and is holding on to her Clima-Tact. The thunder bolt effect thing can be taken off. I haven’t seen the new abilities she’s able to do with them yet but I’m assuming it should be pretty awesome from all the training she’s gotten from the weather island. It was kind of hard to take a good shot of her since her hand is covering her face. 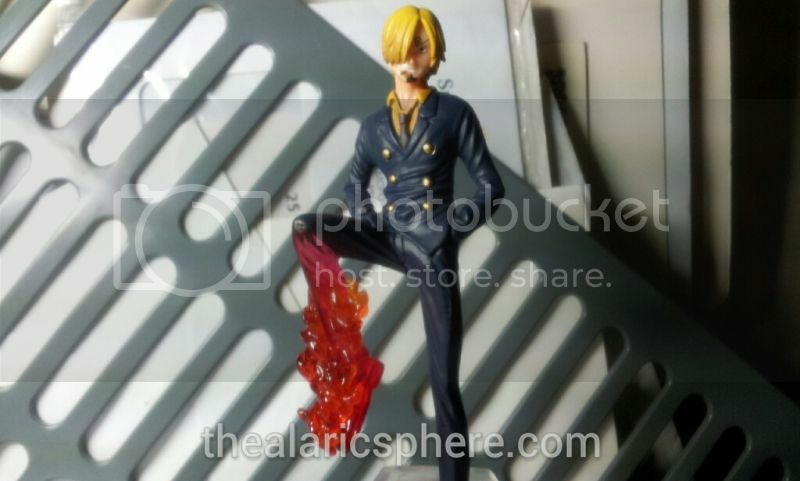 Next is the love cook, Sanji. I had a difficult time taking shots of him since he had hair covering his face. He’s posed with his burning black leg style and has his usual cool and calm demeanor look. 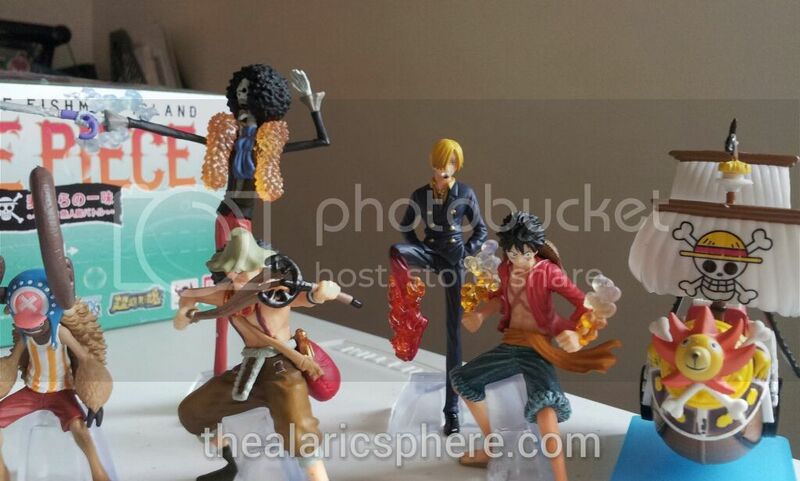 Although Sanji is posed the way he is, it’s not difficult to pose him since he (and everyone else) comes with a clear block to help with standing them up. 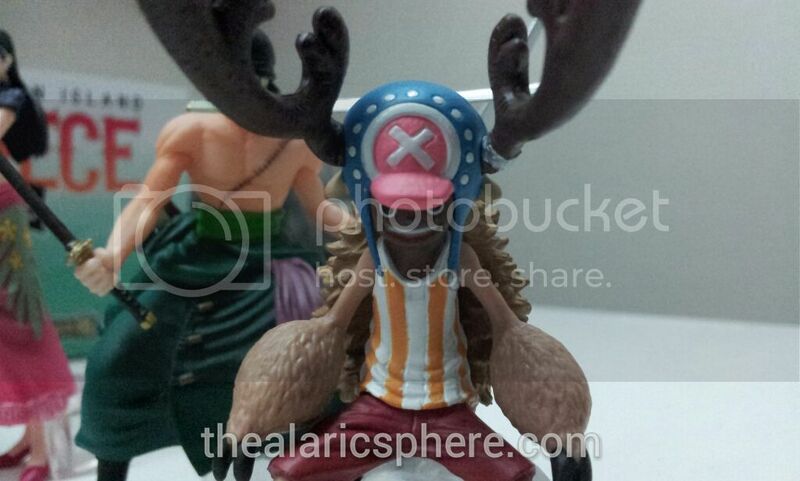 We have the cute and cuddly Tony Tony Chopper next. This was the last piece I got from the boxes I was opening and this is the one that disappointed me the most. 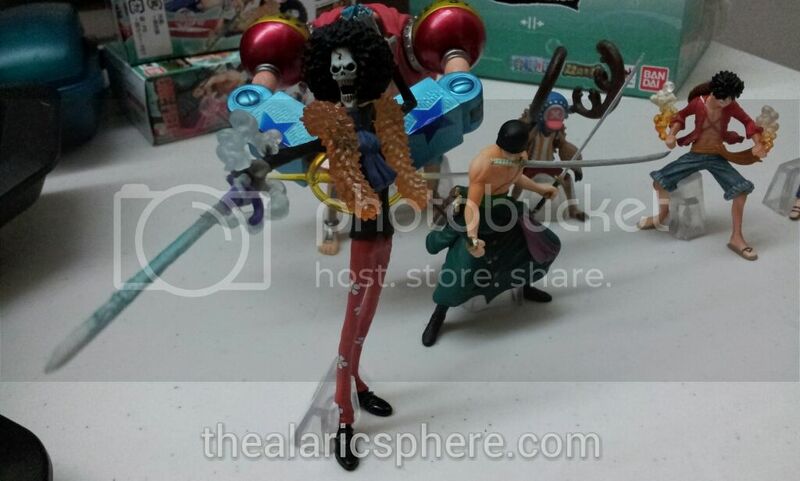 Apart from the fact that he’s in an odd form that I haven’t seen yet in the show, the worst part is that it seems that the one I got was a factory defect in that his face was not painted. So his face is super dark. I’ll wait until I reach this part in the anime, maybe it’s just part of the form. If not, then I’ll just paint it on my own. 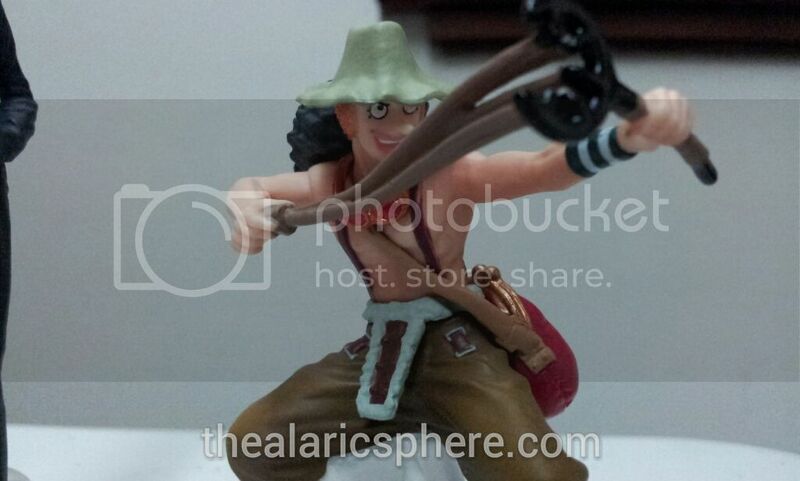 Next is the archaeologist, Nico Robin. 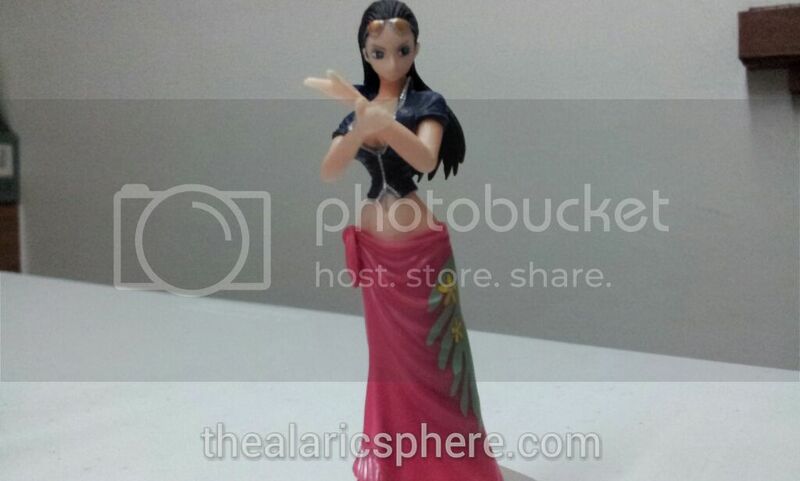 She has the fleur pose going on, but it does not get any more generic than this. 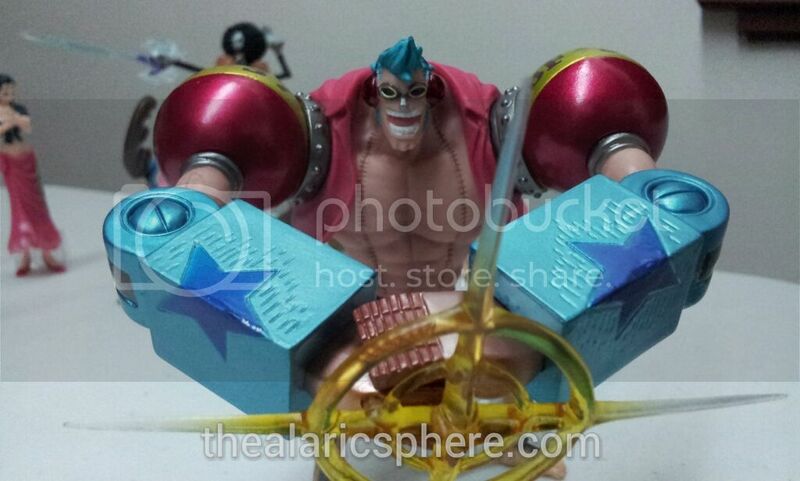 I would have hoped that they added some hand-growing effects. But not a biggie. I really like her character in the show and she has her glasses, skirt and is on exploration mode. Frrrrrrankie! The cyborg. This guy had to be formed up from 8 different parts. It is difficult to stand him up though since he has a tendency to lean forward. I like the pose that he does as well. I don’t know what ability he’s making, but it looks cool. Of course there had to be shots with the whole crew. See? 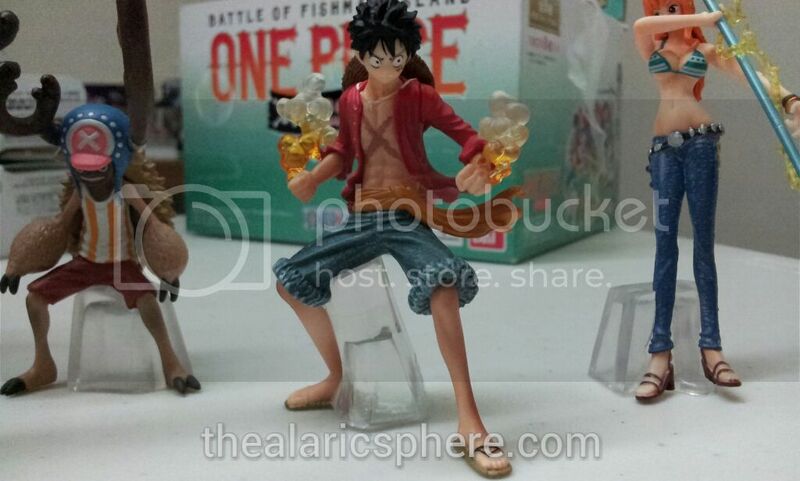 Luffy’s mid pose fits perfectly into any shot. Chopper doesn’t like to look up because his face isn’t painted. Overall, I love what they’ve done with this set. I’m really happy with my purchase. I’ll probably make some storylines using the guys I got combined with some of my other stuff. The set retails for around P2,400 depending on the availability. 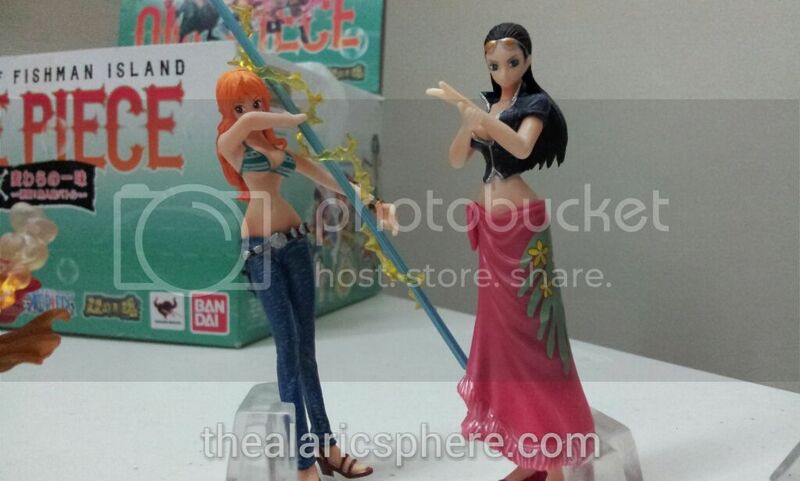 I was able to order mine from Wasabi Toys. 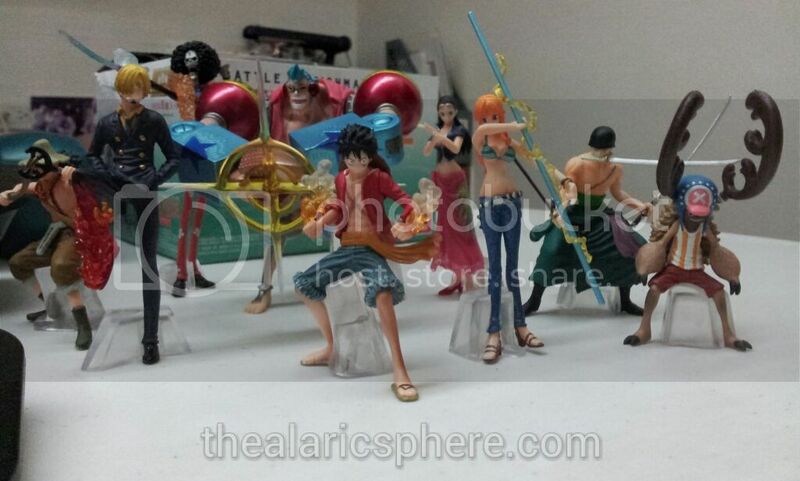 Definitely worth your money for One Piece fans. As a side note, there are shops locally that sell knock offs for much cheaper. I’ll just say that you get what you pay for. *Thousand Sunny isn't included. I just put it there for the "effect"